This is an optional activity, which you can add to your Northern Lights trip booked through Fjord Travel Norway. The activity will appear during the tour booking process, with prices and details. Morning departure. The excursion bus will pick you up in the centre of Tromso, with transfer through beautiful Arctic coastal scenery to the reindeer camp, located a 25 min drive outside Tromso. You can easily imagine the nomadic lifestyle of the Arctic Tundra while taking in the sights of mountains and Fjords on Kvaloya. 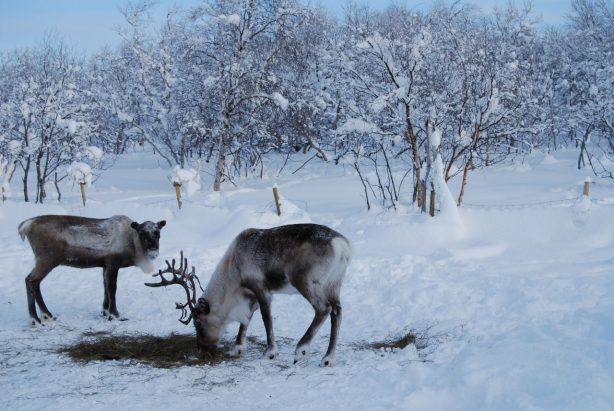 After the trip you will take part in the daily feeding and tending of the reindeer. You can also try your hand at the ancient art of lasso-throwing and listen to traditional singing (joik) and stories of the Sami peoples with the local Sami guide.